Altimeter taps into the GPS capabilities of your iPhone to track your altitude. That’s an ideal feature for hikers, mountain climbers, runners, or bikers who want to see just how far they’ve ascended on a hike, climb, run, or ride. Take Me Higher: Altimeter records your elevation when you start hiking, climbing, running, or biking, and then logs elevation at the end of your exercise to show you how high you climbed and how fast you did it. The app from Stuido Six Digital opens up to current altitude in feet or meters with a stated limited accuracy to about 50 feet. Tap the start button, and Altimeter will record your elevation along with the time. Tap the end button after a hike, bike, walk, or run, and see your results. The app will show you where you started, ended, your climb change, and rate per minute. The app may not be able to get a reading if you aren’t in view of the clear sky. Your phone doesn’t have to be on the whole time for this app to work, and Version 2.0 supports iOS 4 and its multitasking capabilities. Note that devices without GPS chips—the original iPhone and all iPod touch models—won’t be able to take advantage of Altimeter’s features. Altimeter fared well when I tested the app’s accuracy. I stood in the same spot three consecutive days and logged the altitude and the accuracy range the app gave me. On Day One, I recorded a altitude of 978 feet with a plus/minus range of 62 feet; I recorded an altitude of 904 feet the next day with a range of +/- 62 feet. On the third day, the app was unable to fix on an altitude after three minutes—it’s suppose to take between 30 seconds to a minute to get a lock on a satellite—but the altitude ranged between 999 feet and 1039 feet. In a second test, I used Altimeter at the airport in Albany, Mo., which has an elevation of 886 feet, according to the FAA. Altimeter gave me a reading of 866 feet with a variation of +/- 62 feet to +/- 31 feet. It’s not a perfect reading, but it’s close enough for recreational use. 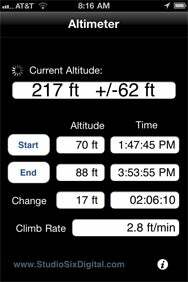 That’s why if you’re an outdoorsy person who like to know the elevation you’ve traversed when you’re out and about, this inexpensive, simple app is a fine tool to have along.